SHORT VERSION: Woke up after day-sleep. Quick data examination. Left house. Blew off towers SW of Norman. Fought through eastern OKC buildings/stoplights/jungles for glimpses of Jones tornado. just a little too far to intercept, as is the usual problem when I’m coming off night shifts. Elke came home from work and woke me up with word of big towers to the W. Say what!?! Discrete convection…could it be? That got my attention and I woke up far more excited than when I crashed 7 hours before. 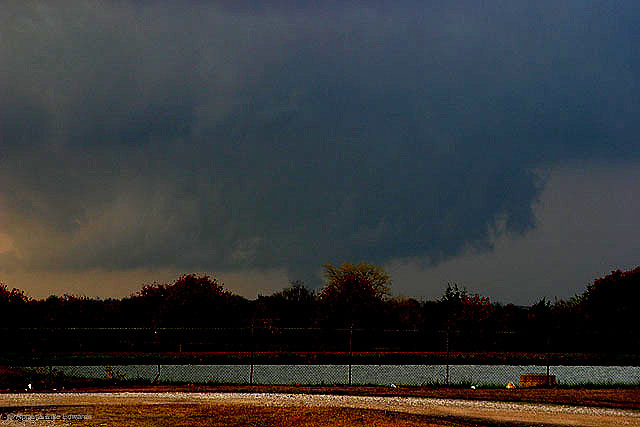 5-minute diagnostic data perusal showed that the air mass thermodynamically was verifying the most optimistic of prior model guidance, which did resemble so-called “cold core” supercell situations. Quick inspection of TLX VWP and Purcell profiler winds showed low level shear was excellent. Towers could be seen visually. 1. Prior forecasts as far out as day-3, suggesting that the boundary layer theta-e would be the main concern (but that sfc dew points in the upper 50s/low 60s — if they could materialize — would make things much more interesting). 2. The razor-thin area of insolation-heated air between the billow clouds and the line of Tcu. Temps in the low 60s…yuck! But I told myself that yes, it was cold enough aloft to offset the sfc coolness and give us a sfc-based lifted parcel. …and proceeded N to the projected position of what was now a mature thunderstorm over downtown OKC, producing audible thunder. 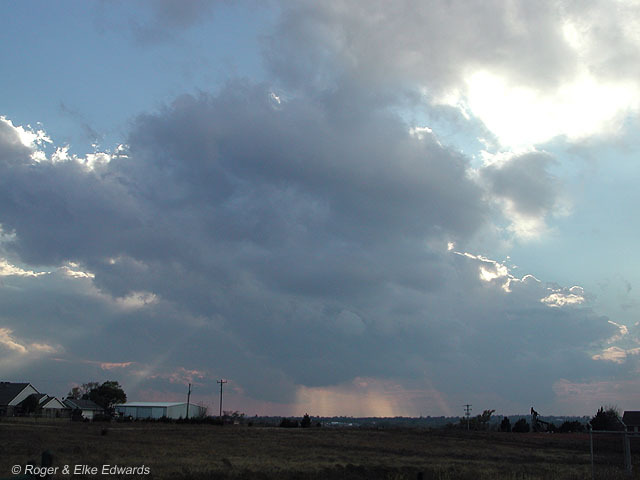 The base came into view S of I-40 and had intermittent ragged lowerings, but had a rather cold/fuzzy look at times too. I got the distinct impression from inspecting this nascent OKC-Jones-Chandler supercell in person, as well as the other towers to the S, that the convection was “running on fumes.” But it was discrete convection, so as Rich alluded earlier in the day, there was hope for a cheezenado — much preferably after the storm left the city. Hills, buildings, the gnarly crosstimbers forest, continual stopping at red lights — as expected in eastern OKC…this all made viewing very brief and intermittent — and photography almost impossible — when trying to keep moving with the storm. We noted a classic looking RFD occlusion to our N from I-40 and Sooner Rd, so the E-N-E-N-E-N zigzagging began. Onward, chainsaw brigade! 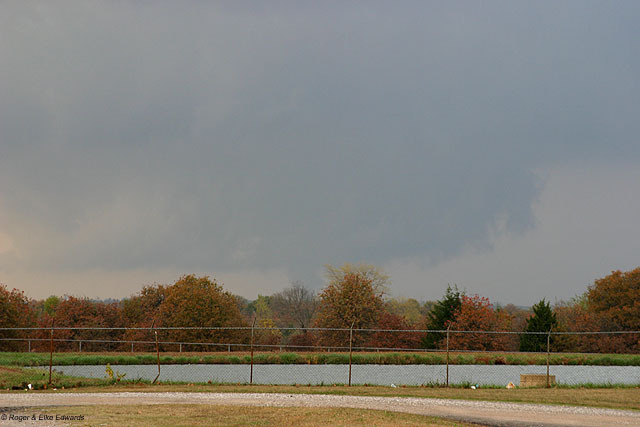 By the time we got SW of Choctaw along S 15 St, we intermittently observed (but couldn’t photograph) a strengthening wall cloud under its base with scud rising fast. The warning went out. Spotters were all over this thing. 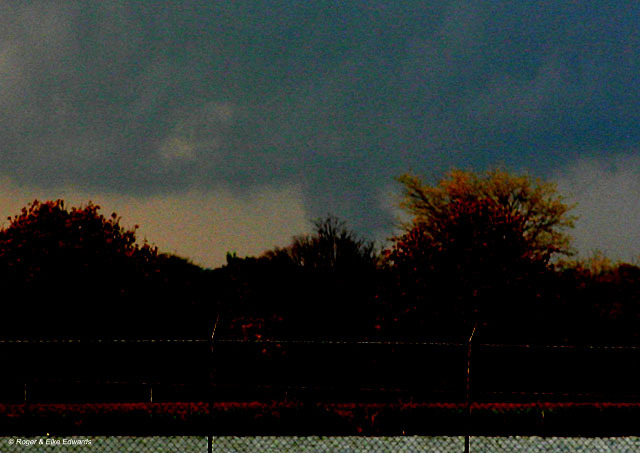 TORNADO FROM 436 PM TO 438 PM. LOCATION ESTIMATED. I probably saw this for a fraction of a second, to our N, while blasting E through the jungle on 15th. I told Elke that I thought there might be a tornado in there. I wasn’t confident enough yet to call it in. Then, after turning N on Henney Rd..
NORTHEAST 63RD STREET AND HENNEY ROAD. Absolutely! If you view(ed) the chopper footage you had a far better view than was possible at ground level. But as the numerous obstructions permitted, we could see rotating plugs and coils of condensation forming near ground level and rising, spiralling, dancing, sometimes hovering detached from both ground and cloud base, and sometimes attached to both ground and cloud for just a second or two. In desperate search of a safe vantage, we settled for a school parking lot on the N side of N 10th St between Henney Rd and Choctaw Rd. With no lightning around, near the rear flank gust front, I grabbed the camera and leaped atop the car like to see above the trees a little better. Of course, the condensation vanished right as I began snapping slides. I don’t know if I caught any of it on film. [Video was not even attempted…no time!] Elke, thankfully, barely managed to get a shot of the tornado with her digital camera from a vantage about 4-5 feet lower than mine — and just a few seconds before it dissipated.